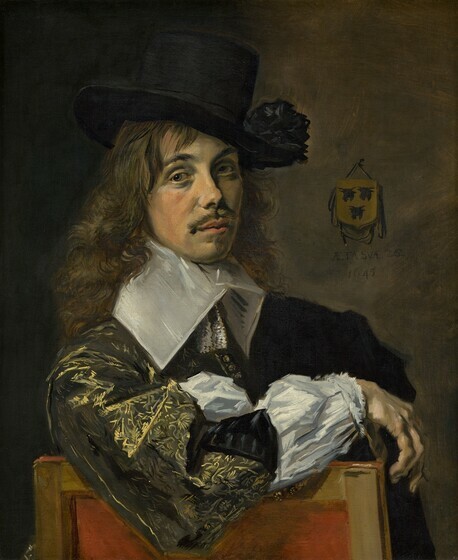 Arthur K. Wheelock Jr., “Frans Hals/Willem Coymans/1645,” Dutch Paintings of the Seventeenth Century, NGA Online Editions, https://purl.org/nga/collection/artobject/76 (accessed April 24, 2019). The crest bearing three cows’ heads, visible on the wall behind the sitter, indicates that this young man is a member of the prosperous Coymans family of Haarlem. The cows’ heads refer directly to the Dutch family name, which translates as "cow man." 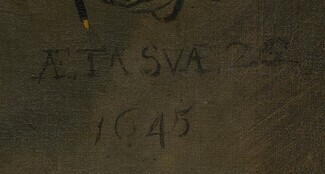 Archival and genealogical information, combined with the Latin inscription "AETA SVAE.22 / 1645" below the shield, identifies the sitter as Willem Coymans, who was twenty-two years old in 1645. The few paintings dated by Frans Hals tend to also provide the subjects’ ages, thus serving as genealogies. In addition to this likeness of Willem, Hals painted the portraits of at least four other members of the Coymans family. Hals was the preeminent portrait painter in Haarlem, the most important artistic center of Holland in the early part of the seventeenth century. He was famous for his uncanny ability to portray his subjects with relatively few bold brushstrokes, and often used informal poses to enliven his portraits. Here, Willem Coymans is informally seated in a chair, with one arm hooked casually over its back to enhance the lifelike quality of his portrait. Coymans, resplendent in his elegant clothes, sports a brocaded jacket with slit sleeves over a pleated white shirt. The dazzling brushwork so typical of Hals is especially evident in the gold embroidery and the crispness of the sleeve. The pom-pom on his hat, pushed forward at a rakish angle, and the oversized collar of his shirt mark Willem as a dandy. With utmost casualness, Willem Coymans has turned to look out at the viewer while resting his right arm lightly on the back of his chair. He is dressed in an elaborately gold embroidered jacket with slit sleeves over a pleated white blouse. His oversized, flat, white linen collar and his modish, pom-pom-embellished black hat, which is pushed forward at a rakish angle, enframe a handsome face with an alert expression. Long wavy hair that reaches to his shoulders completes the impression of a man confident in himself and in his position in society. Katrina V. H. Taylor, “A Note on the Identity of a Member of the Coymans Family by Frans Hals,” in Report and Studies in the History of Art 1969 (Washington, DC, 1970), 106–108. A. A. Vorsterman van Oijen, Stam-en wapenboek van aanzienlijke Nederlandsche familiën (Groningen, 1885). Abraham Bredius, “Archiefsprokkels betreffende Frans Hals,” Oud-Holland 41, no. 1 (1923–1924): 27. The worldly success of the family is vividly evident in Willem Coymans’ demeanor and French mode of dress. Hals utilizes these attributes to convey his sitter’s personality and give his image immediacy. With rapid yet certain strokes of the brush he suggests the rich patterns and flickering light on the elegantly embroidered jacket. In perhaps an even greater tour de force he has captured the translucent qualities of the sleeve by applying dense white strokes of paint over layers of gray. A few firm slashes of black complete the modeling. As is characteristic of Hals, the face is more strongly modeled than is the costume; while the touch is firm and bold around the features, the skin on the nose and cheek is relatively smooth. Seymour Slive, ed., Frans Hals, 3 vols. (London, 1970–1974), 2: pl. 64; 3: no. 42. until the end of his career. Although this pose had been used in the Netherlands by the late sixteenth century in group portraits in which an artist was faced with the problem of representing figures seated around a table, Hals was the first to recognize its potential for portraits of single figures. It was a perfect device for half-length, relatively informal portraits in which he wanted to project the sitter’s personality as directly as possible. Aside from the implied movement in the pose, the man’s gesture of resting his arm over the back of the chair allows the figure to seemingly break through the picture frame and enter into the viewer’s world. The second numeral of the sitter’s age has been changed to a six. Above the inscription is the sitter’s coat of arms, consisting of three black cows’ heads on a gold field. Coymans family, Haarlem. Mrs. Frederick Wollaston, London. (Sedelmeyer Gallery, Paris), before 1894; Rodolphe Kann [d. 1905], Paris, by 1897; purchased 1907 with the entire Kann collection by (Duveen Brothers, Inc., London, New York, and Paris); sold to Arabella D. [Mrs. Collis P.] Huntington [c. 1850-1924], New York; by inheritance to her son, Archer M. Huntington [1870-1955], New York; purchased 17 May 1928 by (Duveen Brothers, Inc.); sold 7 May 1929 to Andrew W. Mellon, Pittsburgh and Washington, D.C.; deeded 28 December 1934 to The A.W. Mellon Educational and Charitable Trust, Pittsburgh; gift 1937 to NGA. Duveen Brothers Records, accession number 960015, Research Library, Getty Research Institute, Los Angeles: reel 322, box 467, folder 2 (copies in NGA curatorial files). The Hudson-Fulton Celebration, The Metropolitan Museum of Art, New York, 1909, no. 37, as Balthasar Coymans. 1928 International Exhibition of Antiques and Art, Olympia, London, 1928, no. X22, as Portrait of Young Koeymanszoon van Ablasserdam. Masterworks of Five Centuries, The Golden-Gate International Exposition, San Francisco, 1939, no. 80a, repro., as Portrait of Balthasar Coymans, Alderman of Haarlem. Frans Hals, National Gallery of Art, Washington, D.C.; Royal Academy of Arts, London; Frans Halsmuseum, Haarlem, 1989-1990, no. 61, repro. Like Father, Like Son? Portraits by Frans Hals and Jan Hals, North Carolina Museum of Art, Raleigh, 2000, pl. 1. Loan to display with permanent collection, The National Gallery, London, 2003-2004. Dutch Portraits: The Age of Rembrandt and Frans Hals, The National Gallery, London; Royal Picture Gallery Mauritshuis, The Hague, 2007-2008, no. 24, repro. Wilhelm R.Valentiner, Catalogue of a Loan Exhibition of Paintings by Old Dutch Masters Held at the Metropolitan Museum of Art in Connection with the Hudson-Fulton Celebration (New York, 1910), 1:38, notes that the "identification of the person is uncertain." The original support is a fine, tightly woven, plain-weave fabric with weave irregularities. It has been lined with the original tacking margins trimmed and the edges of the painting turned over to form the present tacking margins. The reduction in size appears minimal, as marked cusping is present on all sides. A moderately thick tan ground layer lies under a light brown imprimatura layer. Paint was applied thinly, frequently exposing the imprimatura. Both low and high impasto articulate the sleeve and jacket brocade. Although the paint and ground are cupped, there are only minor flake losses, and abrasion is confined to the edges. The painting was treated in 1986. Moes, Ernst Wilhelm. Iconographia Batava. 2 vols. Amsterdam, 1897-1905: 1(1897):205, no. 1779, as Balthasar Coymans. Sedelmeyer, Charles. Illustrated Catalogue of 300 Paintings by Old Masters of the Dutch, Flemish, Italian, French, and English schools, being some of the principal pictures which have at various time formed part of the Sedelmeyer Gallery. Paris, 1898: 66, no. 54, repro., as Koeymanszoon van Ablasserdam. Bode, Wilhelm von. Gemälde-sammlung des Herrn Rudolf Kann in Paris. Vienna, 1900: xviii, pl. 49, as Koeymanszoon van Ablasserdam. Hofstede de Groot, Cornelis. A Catalogue Raisonné of the Works of the Most Eminent Dutch Painters of the Seventeenth Century. 8 vols. Translated by Edward G. Hawke. London, 1907-1927: 3(1910):53, no. 168. Sedelmeyer, Charles. Catalogue of Rodolphe Kann Collection. 2 vols. Paris, 1907: 1:13, 42, no. 40, repro., as Portrait of Young Koeijmanszoon van Ablasserdam. Grant, J. Kirby. "Mrs. Collis P. Huntington’s Collection." The Connoisseur 20 (January 1908): 3 fig. 1, 4, as Young Koeijmanszoon van Ablasserdam. Holmes, Charles John. "Recent Acquisitions by Mrs. C. P. Huntington from the Kann Collection." The Burlington Magazine 12 (January 1908 ): 195-205, repro., as Young Koeijmanszoon of Ablasserdam. Lennep, John C. van. "Portraits in the Kann Collection." The Burlington Magazine 13, no. 65 (August 1908): 293-294. "A Portrait by Hals at the Grafton Galleries." The Burlington Magazine 16 (October 1909): 109-110, as Johan Koeijmans. Moes, Ernst Wilhelm. Frans Hals: sa vie et son oeuvre. Translated by J. de Bosschere. Brussels, 1909: 101, no. 27. Valentiner, Wilhelm R. Catalogue of a collection of paintings by Dutch masters of the seventeenth century. The Hudson-Fulton Celebration 1. Exh. cat. Metropolitan Museum of Art, New York, 1909: xv, 38, no. 37, repro., 154, 159, as Balthasar Coymans, Alderman of Haarlem. Valentiner, Wilhelm R. Catalogue of a Loan Exhibition of Paintings by Old Dutch Masters Held at the Metropolitan Museum of Art in Connection with the Hudson-Fulton Celebration. New York, 1910: 6, 145, no. 37, repro. 144., as Balthasar Coymans, Alderman of Haarlem. Valentiner, Wilhelm R. "Die Ausstellung holländischer Gemälde in New York." Monatshefte für Kunstwissenschaft 3 (1910): 6, 7 n. 5, as "not Joseph Coymans." Bode, Wilhelm von, and Moritz Julius Binder. Frans Hals: His Life and Work. 2 vols. Translated by Maurice W. Brockwell. Berlin, 1914: 2:19, no. 245, pl. 155a. Bode, Wilhelm von, and Moritz Julius Binder. Frans Hals: Sein Leben und seine Werke. 2 vols. Berlin, 1914: 2:65, no. 245, pl. 155a. Valentiner, Wilhelm R. Frans Hals: des meisters Gemälde in 318 Abbildungen. Klassiker der Kunst in Gesamtausgaben 28. Stuttgart and Berlin, 1921: 319, no. 212, repro. Valentiner, Wilhelm R. Frans Hals: des Meisters Gemälde in 322 Abbildungen. Klassiker der Kunst in Gesamtausgaben 28. 2nd ed. Stuttgart, Berlin, and Leipzig, 1923: 320, no. 225, repro. Dülberg, Franz. Frans Hals: Ein Leben und ein Werk. Stuttgart, 1930: 178-180, repro. Valentiner, Wilhelm R. Frans Hals Paintings in America. Westport, Connecticut, 1936: no. 82, repro. Cortissoz, Royal. An Introduction to the Mellon Collection. Boston, 1937: 40. Golden Gate International Exposition. Masterworks of Five Centuries. Exh. cat. Golden Gate International Exposition, San Francisco, 1939: no. 80a, repro., as Portrait of Balthasar Coymans, Alderman of Haarlem. Duveen Brothers. Duveen Pictures in Public Collections of America. New York, 1941: no. 194, repro., as Portrait of Balthasar Coymans. Preliminary Catalogue of Paintings and Sculpture. National Gallery of Art, Washington, 1941: 95, no. 69, as Balthasar Coymans. National Gallery of Art. Book of illustrations. 2nd ed. Washington, 1942: no. 69, repro. 24, 240, as Balthasar Coymans. Cairns, Huntington, and John Walker, eds. Masterpieces of Painting from the National Gallery of Art. Translated. New York, 1944: 96, color repro., as Balthasar Coyman. National Gallery of Art. Paintings and Sculpture from the Mellon Collection. Washington, 1949 (reprinted 1953 and 1958): 77, repro., as Balthasar Coymans. Walker, John. National Gallery of Art, Washington. New York, 1956: 44, repro.. as Balthasar Coymans. Slive, Seymour. "Frans Hals’ Portrait of Joseph Coymans." Wadsworth Atheneum Bulletin 4 (Winter 1958): 13-23, fig. 10. The National Gallery of Art and Its Collections. Foreword by Perry B. Cott and notes by Otto Stelzer. National Gallery of Art, Washington (undated, 1960s): 20, as Balthasar Coymans. Beeren, Willem. Frans Hals. New York, 1963: 89, no. 49, repro. Walker, John. National Gallery of Art, Washington, D.C. New York, 1963 (reprinted 1964 in French, German, and Spanish): 178, repro. National Gallery of Art. Summary Catalogue of European Paintings and Sculpture. Washington, 1965: 65, as Balthasar Coymans. Cairns, Huntington, and John Walker, eds. A Pageant of Painting from the National Gallery of Art. 2 vols. New York, 1966: 1: 216, color repro., as Balthasar Coymans. National Gallery of Art. European Paintings and Sculpture, Illustrations. Washington, 1968: 57, repro., as Balthasar Coymans. Taylor, Katrina V. H. "A note on the identity of a member of the Coymans family by Frans Hals." Report and Studies in the History of Art 3 (1969): 106-108, fig. 1. Slive, Seymour. Frans Hals. 3 vols. National Gallery of Art Kress Foundation Studies in the History of European Art. London, 1970–1974: 1(1970):160, 185; 2(1970):pls. 253, 255; 3(1974):85-86, no. 166. Grimm, Claus. Frans Hals: Entwicklung, Werkanalyse, Gesamtkatolog. Berlin, 1972: 17, no. 130, figs. 145, 148. Montagni, E.C. L’opera completa di Frans Hals. Classici dell’Arte. Milan, 1974: 104, no. 167, repro., color repro. 51, and cover. European Paintings: An Illustrated Summary Catalogue. National Gallery of Art, Washington, 1975: 170, repro., as Balthasar Coymans. Walker, John. National Gallery of Art, Washington. New York, 1975: 266-267, no. 349, repro. Montagni, E.C. Tout l'oeuvre peint de Frans Hals. Translated by Simone Darses. Les classiques de l'art. Paris, 1976: no. 167, repro. Haverkamp-Begemann, Egbert, ed. The Netherlands and the German-speaking countries, fifteenth-nineteenth centuries. Wadsworth Atheneum paintings catalogue 1. Hartford, 1978: 148. Baard, H. P. Frans Hals. New York, 1981: fig. 66. Walker, John. National Gallery of Art, Washington. Rev. ed. New York, 1984: 266, no. 343, color repro. European Paintings: An Illustrated Catalogue. National Gallery of Art, Washington, 1985: 196, repro. Pelfrey, Robert H., and Mary Hall-Pelfrey. Art and Mass Media. New York, 1985: 98, repro. Sutton, Peter C. A Guide to Dutch Art in America. Grand Rapids and Kampen, 1986: 308, fig. 460. Slive, Seymour. Frans Hals. Exh. cat. National Gallery of Art, Washington; Royal Academy of Arts, London; Frans Halsmuseum, Haarlem. London, 1989: no. 61. Grimm, Claus. Frans Hals: The Complete Work. Translated by Jürgen Riehle. New York, 1990: 95, color fig. 15a, 186, color fig. 66, 193-194, 288, no. 127, repro. Wheelock, Arthur K., Jr. Dutch Paintings of the Seventeenth Century. The Collections of the National Gallery of Art Systematic Catalogue. Washington, 1995: 76-79, color repro. 77. Tansey, Richard G. and Fred S. Kleiner. Gardner's Art Through the Ages. 10th ed. Fort Worth, 1996: 855, color fig. 24.45. Weller, Dennis P. Like Father, Like Son? Portraits by Frans Hals and Jan Hals. Exh. cat. North Carolina Museum of Art, Raleigh, 2000: pl. 1. Beyer, Andreas. Das Porträt in der Malerei. Munich, 2002: 199-200, repro. Dehne, Bernd, Helmuth Kern, and Erika Kern. Mensch, Kunst!. Basisreihe Kunst 4. Leipzig, 2002: 118, repro. Atkins, Christopher. "Frans Hals's Virtuoso Brushwork." Nederlands Kunsthistorisch Jaarboek (2003): 296, repro. Hand, John Oliver. National Gallery of Art: Master Paintings from the Collection. Washington and New York, 2004: 188, no. 148, color repro. Duffy-Zeballos, Lisa. "Frans Hals' Willem Coymans." Archives of Facial Plastic Surgery 7, no. 2 (March/April 2005): 152-153, color repro. Ekkart, Rudolf E.O., and Quentin Buvelot. Dutch portraits: the age of Rembrandt and Frans Hals. Translated by Beverly Jackson. Exh. cat. National Gallery, London; Royal Picture Gallery Mauritshuis, The Hague. London, 2007: 130-131, no. 24, repro. Buvelot, Quentin. "El retrato holandés." Numen 2 (2008): 11-12, repro. Atkins, Christopher D.M. The Signature Style of Frans Hals: Painting, Subjectivity, and the Market in Early Modernity. Amsterdam, 2012: 105-106, 292, color fig. 71. Bennett, Shelly M. The Art of Weath: The Huntingtons in the Gilded Age. San Marino, 2013: 156, 161-161, 163, 177, 267-268, 270, color fig. 3.24. The inscription reads “22” in Charles Sedelmeyer, Illustrated Catalogue of 300 Paintings by Old Masters . . . (Paris, 1898), 66, but “26” in Sedelmeyer, Catalogue of Rudolf Kann Collection, 2 vols. (Paris, 1907), 1:13. Ernest Wilhelm Moes, Iconographia Batava, 2 vols. (Amsterdam, 1897–1905), 1:205, no. 1779, first identified the sitter as Balthasar, who was Lord of Streefkerk and Nieuw Lekkerland and town councillor of Haarlem. The biographical data on the Coymans family was first published by Johan E. Elias, De vroedschap van Amsterdam, 1578–1795, 2 vols. (Haarlem, 1903–1905), 2:762. Seymour Slive, “Frans Hals’ Portrait of Joseph Coymans,” Wadsworth Atheneum Bulletin (Winter 1958): 20–21 note 7. Katrina V. H. Taylor, “A Note on the Identity of a Member of the Coymans Family by Frans Hals,” in Report and Studies in the History of Art 1969 (Washington, DC, 1970), 107. For the portraits of Joseph Coymans and Dorothea Berck, see Seymour Slive, ed., Frans Hals, 3 vols. (London, 1970–1974), 2: pls. 243, 244; 3: nos. 160, 161. For information on the Coymans family, see Seymour Slive, “Frans Hals’ Portrait of Joseph Coymans,” Wadsworth Atheneum Bulletin (Winter 1958): 12–23. For portraits of Stephanus Geraerdts and Isabella Coymans, see Seymour Slive, ed., Frans Hals, 3 vols. (London, 1970–1974), 2: pls. 290, 291; 3: nos. 188, 189. Seymour Slive, ed., Frans Hals, 3 vols. (London, 1970–1974), 2: pl. 64; 3: no. 42.